Iraq (/ɪˈræk/, /ɪˈrɑːk/ ( listen) or /aɪˈræk/; Arabic: العراق‎ al-‘Irāq; Kurdish: عێراق‎ Eraq), officially known as the Republic of Iraq (Arabic: جُمُهورية العِراق‎ Jumhūrīyyat al-‘Irāq; Kurdish: کۆماری عێراق‎ Komari Eraq), is a country in Western Asia, bordered by Turkey to the north, Iran to the east, Kuwait to the southeast, Saudi Arabia to the south, Jordan to the southwest and Syria to the west. The capital, and largest city, is Baghdad. Iraq is home to diverse ethnic groups including Arabs, Kurds, Assyrians, Turkmen, Shabakis, Yazidis, Armenians, Mandeans, Circassians and Kawliya. Around 95% of the country's 37 million citizens are Muslims, with Christianity, Yarsan, Yezidism and Mandeanism also present. The official languages of Iraq are Arabic and Kurdish. The country today known as Iraq was a region of the Ottoman Empire until the partition of the Ottoman Empire in the 20th century. It was made up of three provinces, called vilayets in the Ottoman language: Mosul Vilayet, Baghdad Vilayet, and Basra Vilayet. In April 1920 the British Mandate of Mesopotamia was created under the authority of the League of Nations. A British-backed monarchy joining these vilayets into one Kingdom was established in 1921 under Faisal I of Iraq. The Hashemite Kingdom of Iraq gained independence from the UK in 1932. In 1958, the monarchy was overthrown and the Iraqi Republic created. Iraq was controlled by the Arab Socialist Ba'ath Party from 1968 until 2003. After an invasion by the United States and its allies in 2003, Saddam Hussein's Ba'ath Party was removed from power, and multi-party parliamentary elections were held in 2005. The US presence in Iraq ended in 2011, but the Iraqi insurgency continued and intensified as fighters from the Syrian Civil War spilled into the country. Out of the insurgency came a highly destructive group calling itself ISIL, which took large parts of the north and west. It has since been largely defeated. Disputes over the sovereignty of Iraqi Kurdistan continue. A referendum about the full sovereignty of Iraqi Kurdistan was held on 25 September 2017. On 9 December 2017, Iraqi Prime Minister Haider al-Abadi declared victory over ISIL after the group lost its territory in Iraq. Iraq is a founding member of the UN as well as of the Arab League, OIC, Non-Aligned Movement and the IMF. It is a federal parliamentary republic consisting of 19 governorates (provinces) and one autonomous region (Iraqi Kurdistan). The country's official religion is Islam. Culturally, Iraq has a very rich heritage and celebrates the achievements of its past in pre-Islamic times and is known for its poets. Its painters and sculptors are among the best in the Arab world, some of them being world-class as well as producing fine handicrafts, including rugs and carpets. During the medieval period, there was a region called ʿIrāq ʿArabī ("Arabian Iraq") for Lower Mesopotamia and ʿIrāq ʿajamī ("Foreign Iraq"), for the region now situated in Central and Western Iran. The term historically included the plain south of the Hamrin Mountains and did not include the northernmost and westernmost parts of the modern territory of Iraq. Prior to the middle of the 19th century, the term Eyraca Arabic was commonly used to describe Iraq. In accordance with the 2005 Constitution, the official name of the state is the "Republic of Iraq" (Jumhūrīyyat al-‘Irāq). The country today known as Iraq was a region of the Ottoman Empire until the partition of the Ottoman Empire in the 20th century. It was made up of three provinces, called vilayets in the Ottoman language: Mosul Vilayet, Baghdad Vilayet, and Basra Vilayet. These three provinces were joined into one Kingdom by the British after the region became a League of Nations mandate, administered under British control, with the name "State of Iraq". The British established the Hashemite king, Faisal I of Iraq, who had been forced out of Syria by the French, as their client ruler. Likewise, British authorities selected Sunni Arab elites from the region for appointments to government and ministry offices. In 1979, the Iranian Revolution took place. Following months of cross-border raids between the two countries, Saddam declared war on Iran in September 1980, initiating the Iran–Iraq War (or First Persian Gulf War). Taking advantage of the post-revolution chaos in Iran, Iraq captured some territories in southwest of Iran, but Iran recaptured all of the lost territories within two years, and for the next six years Iran was on the offensive. The war, which ended in stalemate in 1988, had cost the lives of between half a million and 1.5 million people. In 1981, Israeli aircraft bombed an Iraqi nuclear materials testing reactor at Osirak and was widely criticised at the United Nations. During the eight-year war with Iran, Saddam Hussein extensively used chemical weapons against Iranians. In the final stages of the Iran–Iraq War, the Ba'athist Iraqi regime led the Al-Anfal Campaign, a genocidal campaign that targeted Iraqi Kurds, and led to the killing of 50,000–100,000 civilians. Chemical weapons were also used against Iraqi Shia civilians during the 1991 uprisings in Iraq. In response to rapid territorial gains made by the Islamic State of Iraq and the Levant (ISIL) during the first half of 2014, and its universally-condemned executions and reported human rights abuses, many states began to intervene against it in the Iraqi Civil War (2014–present). Since the airstrikes started, ISIL has been losing ground in both Iraq and Syria. Tens of thousands of civilians have been killed in Iraq in ISIL-linked violence. The genocide of Yazidis by ISIL has led to the expulsion, flight and effective exile of the Yazidis from their ancestral lands in Northern Iraq. The 2016 Karrada bombing killed nearly 400 civilians and injured hundreds more. On 17 March 2017, a US-led coalition airstrike in Mosul killed more than 200 civilians. In September 2017, a referendum was held regarding Kurdish independence in Iraq. 92% of Iraqi Kurds voted in favor of independence. The referendum was regarded as illegal by the federal government in Baghdad. In March 2018, Turkey launched military operations to eliminate the Kurdish separatist fighters in northern Iraq. Anti-American cleric Muqtada al-Sadr's political coalition has won Iraq's parliamentary election in May 2018. Transparency International ranks Iraq's government as the eighth-most-corrupt government in the world. Government payroll have increased from 1 million employees under Saddam Hussein to around 7 million employees in 2016. In combination with decreased oil prices, the government budget deficit is near 25% of GDP as of 2016. A report published by the European Parliamentary Research Service suggests that in 2015 there was 24 million Arabs (15 million Shia and 9 million Sunni); 4 million Sunni Kurds (plus 500,000 Shia Faili Kurds and 200,000 Kaka'i); 3 million Iraqi Turkmen/Turkoman; 1 million Black Iraqis; 500,000 Christians (including Assyrians and Armenians); 500,000 Yazidis; 250,000 Shabaks; 50,000 Roma; 3,000 Sabean-Mandaeans; 2,000 Circassians; 1,000 Baha’i; and a few dozen Jews. Muslim (official) 99% (Shia 55-60%, Sunni 40%), Christian <.1%, Yazidi <.1%, Sabean Mandaean <.1%, Baha'i <.1%, Zoroastrian <.1%, Hindu <0.1%, Buddhist <0.1%, Jewish <0.1%, folk religion <0.1, unafilliated 0.1%, other <0.1% It has a mixed Shia and Sunni population. The CIA World Factbook estimates that around 65% of Muslims in Iraq are Shia, and around 35% are Sunni. A 2011 Pew Research Center estimates that 51% of Muslims in Iraq are Shia, 42% are Sunni, while 5% identify themselves as "Just a Muslim". The Sunni Muslims, 12-13 million in a population of 36 million, include Arabs, most Turkomen, and Kurds. Indigenous Neo Aramaic speaking Assyrians, most of whom are adherents of the Chaldean Catholic Church, Assyrian Church of the East, Ancient Church of the East, Assyrian Pentecostal Church, Syriac Orthodox Church and Syriac Catholic Church account for most of the Christian population. Estimates for the numbers of Christians suggest a decline from 8–12% in the mid-20th century to 5% in 2008 or 1.6 million. More than half of Iraqi Christians have fled to neighbouring countries since the start of the war, and many have not returned, although a number are migrating back to the traditional Assyrian homeland in the Kurdish Autonomous region. As of 2011, nearly 3 million Iraqis have been displaced, with 1.3 million within Iraq and 1.6 million in neighbouring countries, mainly Jordan and Syria. More than half of Iraqi Christians have fled the country since the 2003 US-led invasion. According to official United States Citizenship and Immigration Services statistics, 58,811 Iraqis have been granted refugee-status citizenship as of May 25, 2011. Iraqi media expert and author of a number of reports on this subject, Ibrahim Al Marashi, identifies four stages of the US invasion of Iraq in 2003 where they had been taking the steps that have significant effects on the way for the later of the Iraqi media since then. Stages are: pre-invasion preparation, and the war and the actual choice of targets, the first post-war period, and a growing insurgency and hand over power to the Iraqi Interim Government (IIG) and Prime Minister Iyad Allawi. 1 2 3 4 "Iraq". International Monetary Fund. ↑ "Declaration of Principles for a Long-Term Relationship of Cooperation and Friendship Between the Republic of Iraq and the United States of America". 2007-11-26. ↑ "Top 10 Battles for the Control of Iraq". Livescience.com. Retrieved 2009-03-23. 1 2 Basu, Moni (2011-12-18). "Deadly Iraq war ends with exit of last U.S. troops". CNN.com. Retrieved 18 December 2011. ↑ "Online Etymology Dictionary". Etymonline.com. 1979-12-10. Retrieved 2009-03-23. ↑ Halloran, John A. (2000). "Sumerian Lexicon". The name of the very ancient city of URUK- City of Gilgamesh is made up from the UR-city and UK- thought to mean existence (a-ku, a-Ki & a-ko. The Aramaic and Arabic root of IRQ and URQ denotes rivers or tributaries at the same times referring to condensation (of water). ↑ "ʿERĀQ-E ʿAJAM(Ī)". Encyclopaedia Iranica. Retrieved 2016-08-17. ↑ Salmon, Thomas (1767). A New Geographical and Historical Grammar. Sands, Murray, and Cochran. ↑ Boesch, Hans H. (1 October 1939). "El-'Iraq". Economic Geography. 15 (4): 329. doi:10.2307/141771. JSTOR 141771. 1 2 Ralph S. Solecki, Rose L. Solecki, and Anagnostis P. Agelarakis (2004). The Proto-Neolithic Cemetery in Shanidar Cave. Texas A&M University Press. pp. 3–5. ISBN 9781585442720. ↑ "Akkad". Ancient History Encyclopedia. Retrieved 2017-08-18. ↑ Wolkstein, Diane; Kramer, Samuel Noah (1983). Inanna: Queen of Heaven and Earth: Her Stories and Hymns from Sumer. New York City, New York: Harper&Row Publishers. pp. 118–119. ISBN 0-06-090854-8. ↑ Kramer, Samuel Noah (1963). The Sumerians: Their History, Culture, and Character. Chicago, Illinois: University of Chicago Press. pp. 71–72. ISBN 0-226-45238-7. ↑ N, Al-Zahery; M, Pala; V, Battaglia; V, Grugni; MA, Hamod; B, Hooshiar Kashani; A, Olivieri; A, Torroni; AS, Santachiara-Benerecetti; O, Semino (4 October 2011). "In search of the genetic footprints of Sumerians: a survey of Y-chromosome and mtDNA variation in the Marsh Arabs of Iraq". US National Library of Medicine. doi:10.1186/1471-2148-11-288. PMID 21970613. ↑ Ghareeb, Edmund; Dougherty, Beth (2004). Historical Dictionary of Iraq. Historical Dictionaries of Asia, Oceania, and the Middle East. 44. Lanham, Maryland: Scarecrow Press. p. 156. ISBN 9780810865686. ↑ Kubba, Sam (2011). The Iraqi Marshlands and the Marsh Arabs: The Ma'dan, Their Culture and the Environment. Reading, England: Itahca Press. p. 6. ISBN 978-0-86372-333-9. ↑ "The Princeton Encyclopedia of Classical Sites, Iraq". ↑ electricpulp.com. "HATRA – Encyclopaedia Iranica". ↑ "The Islamic World to 1600: The Arts, Learning, and Knowledge (Conclusion)". Acs.ucalgary.ca. Archived from the original on August 15, 2009. ↑ "The Islamic World to 1600: The Mongol Invasions (The Black Death)". The University of Calgary. Archived from the original on January 31, 2009. ↑ Kathryn Jean Lopez (14 September 2005). "Q&A with John Kelly on The Great Mortality on National Review Online". Nationalreview.com. Archived from the original on 2012-02-16. Retrieved 9 November 2016. ↑ Reidar Visser (2005). Basra, the Failed Gulf State: Separatism And Nationalism in Southern Iraq. LIT Verlag Münster. p. 19. ISBN 978-3-8258-8799-5. Retrieved 2016-08-17. ↑ "Population crises and cycles in history A review of the book Population Crises and Population cycles by Claire Russell and W.M.S. Russell." valerieyule.com.au. ISBN 0-9504066-5-1. Retrieved 2016-08-17. ↑ Tripp, Charles (2002). A History of Iraq. Cambridge University Press. ISBN 978-0-521-52900-6. Retrieved 2016-08-17. ↑ Luedke, Tilman (2008). "Iraq". Oxford Encyclopedia of the Modern World. Oxford University Press. ISBN 978-0-19-517632-2. Retrieved 2018-06-13. ↑ Wilson, Jeremy (1998). Lawrence of Arabia: The Authorised Biography of T. E. Lawrence. Stroud: Sutton. ISBN 0750918772. The exploits of T.E. Lawrence as British liaison officer in the Arab Revolt, recounted in his work Seven Pillars of Wisdom, made him one of the most famous Englishmen of his generation. This biography explores his life and career including his correspondence with writers, artists and politicians. ↑ "Oxford DNB article: Cox, Sir Percy Zachariah". 1 2 Williams, Timothy (2009-12-02). "In Iraq's African Enclave, Color Is Plainly Seen". The New York Times. ↑ Cleveland, William (2016). A History of the Modern Middle East. Boulder, CO: Westview Press. ↑ Karsh, Efraim (2002). The Iran–Iraq War, 1980–1988. Oxford, Oxfordshire: Osprey Publishing. ISBN 978-1841763712. ↑ Hardy, Roger (2005-09-22). "The Iran–Iraq war: 25 years on". BBC News. Retrieved 2011-06-19. ↑ S-RES-487(1981) Security Council Resolution 487 (1981)". United Nations. Retrieved 19 June 2011., "Archived copy". Archived from the original on 2011-06-21. Retrieved 2011-06-19. ↑ Hiltermann, J. R. (2007). A Poisonous Affair: America, Iraq, and the Gassing of Halabja. Cambridge University Press. pp. 134–135. ISBN 978-0-521-87686-5. Retrieved 2016-08-17. ↑ Rick Atkinson (1993). Crusade: The Untold Story of the Persian Gulf War. Houghton Mifflin Harcourt. pp. 284–285. ISBN 978-0-395-71083-8. Retrieved 2016-08-17. ↑ "The Ameriya Shelter – St. Valentine's Day Massacre". Uruknet.de. Archived from the original on 2011-07-16. Retrieved 2011-06-19. ↑ "'Smarter' bombs still hit civilians". Christian Science Monitor. 2002-10-22. Retrieved 2011-06-19. ↑ Ian Black (2007-08-22). "'Chemical Ali' on trial for brutal crushing of Shia uprising". The Guardian. London. Retrieved 2011-06-19. ↑ Rubin, Michael (December 2001). "Sanctions on Iraq: A Valid Anti-American Grievance?". 5 (4). Middle East Review of International Affairs: 100–115. Archived from the original on 2012-10-28. ↑ Dyson, Tim; Cetorelli, Valeria (2017-07-01). "Changing views on child mortality and economic sanctions in Iraq: a history of lies, damned lies and statistics". BMJ Global Health. 2 (2): e000311. doi:10.1136/bmjgh-2017-000311. ISSN 2059-7908. ↑ "Saddam Hussein said sanctions killed 500,000 children. That was 'a spectacular lie.'". Washington Post. Retrieved 2017-08-04. ↑ "Saddam Hussein's Two Co-Defendants Hanged in Iraq". Bloomberg L.P. 2007-01-15. Archived from the original on 2007-09-30. Retrieved 2007-08-18. ↑ "Report: ISIL losing in Iraq, Syria; gaining in Libya". Al Jazeera. 1 June 2016. Retrieved 26 September 2016. ↑ "The world’s lack of outrage over tens of thousands of civilian deaths in Mosul is shameful". The Independent. 21 July 2017. ↑ "The UN has blamed "Islamic State" in the genocide of the Yazidis". Radio Free Europe/Radio Liberty. 19 March 2015. ↑ Alkhshali, Hamdi; Karadsheh, Jomana (31 March 2015). "Iraq: Parts of Tikrit taken back from ISIS". CNN. ↑ "US praises role of Iranian-backed Shiite militias in Baiji operation". The Long War Journal. ↑ Arango, Tim (13 November 2015). "Sinjar Victory Bolsters Kurds, but Could Further Alienate U.S. From Iraq". New York Times. ↑ "Iraq Claims a Key Victory Over ISIS in Ramadi, Seizes Government Complex". NBC News. ↑ "Iraqi commander: Fallujah 'fully liberated' from ISIS". Fox News. Fox News Network. ↑ Ahmed Aboulenein (10 December 2017). "Iraq holds victory parade after defeating Islamic State". Reuters. Retrieved 11 December 2017. ↑ "92% of Iraqi Kurds back independence from Baghdad, election commission says - France 24". France 24. 2017-09-27. Retrieved 2017-11-14. ↑ "Iraq court rules no region can secede after Kurdish independence bid". Reuters. 2017-11-06. ↑ "Turkey will drain 'terror swamp' in Iraq's Qandil, Erdogan says". Reuters. 11 June 2018. ↑ "Cleric Moqtada al-Sadr's bloc wins Iraq election". Reuters. 12 May 2018. ↑ "Failed States Index Scores 2018". fundforpeace.org. Archived from the original on 2018-06-22. ↑ "Freedom in the World 2013" (PDF). Freedom House. 2013. p. 21. Retrieved 2016-08-17. ↑ "The Failed States Index 2013". fundforpeace.org. Archived from the original on 2015-02-06. ↑ "Iraq's Incumbent PM Nouri Al-Maliki Grows More Isolated As He Clings To Power". Huffington Post. 13 August 2014. Archived from the original on 13 August 2014. Retrieved 14 August 2014. ↑ "Abadi agonistes". The Economist. ISSN 0013-0613. Retrieved 2016-04-21. ↑ "Iraq Personal Status Law of 1959 (ABA Translation)" (PDF). American Bar Association. Retrieved 2016-08-17. ↑ "Women In Personal Status Laws: Iraq, Jordan, Lebanon, Palestine, Syria" (PDF). SHS Papers in Women's Studies/ Gender Research, No. 4. UNESCO. July 2005. ↑ Fox, Jonathan (2008). A World Survey of Religion and the State. Cambridge University Press. p. 238. ISBN 978-1-139-47259-3. Retrieved 2016-08-17. ↑ "Religion, Law, and Iraq's Personal Status Code". Islamopedia Online. Retrieved 2016-08-17. ↑ "Annex H 2010 Updates". Home.comcast.net. January 2010. Archived from the original on 2012-10-26. 1 2 3 4 "The New Iraqi Security Forces". Web.archive.org. 2006-04-20. Archived from the original on 2006-07-18. Retrieved 2013-01-25. ↑ "Iraq Weekly Status Report March 21, 2007" (PDF). Bureau of Near Eastern Affairs US Department of State. Retrieved 2016-08-17. ↑ "Strategic Framework Agreement" (PDF). p. 8. Archived from the original (PDF) on 2010-04-14. Retrieved 2015-11-16. ↑ Muhanad Mohammed (December 19, 2012). "Iran, Iraq seek diplomatic end to border dispute". Reuters. Retrieved August 18, 2012. ↑ Iraqi Constitution, Article 4. ↑ Byrne, Ashley (2009-07-06). "Saddam's rule 'better' for gay Iraqis". BBC News. Retrieved 2013-01-25. ↑ Al-Kadhi, Amrou (2017-07-05). "As a gay man born in Iraq, I know that western intervention is to blame for the murder of LGBT Iraqis". The Independent. Retrieved 2017-10-01. ↑ "Gay Life After Saddam". BBC. ↑ Samuels, Lennox (2008-08-25). "Don't Ask, Do Kill: Gays Persecuted in Iraq". Newsweek. ↑ Tatchell, Peter. "Iraq's queer underground railroad". The Guardian. 1 2 3 4 5 6 "Iraq". CIA Factbook. 1 2 3 "Unemployment Threatens Democracy in Iraq" (PDF). USAID Iraq. January 2011. Archived from the original (PDF) on 2013-05-11. 1 2 3 Sarah Bailey and Rachel Atkinson (2012-11-19). "Humanitarian action in Iraq: putting the pieces together". Overseas Development Institute. Archived from the original on 2012-05-15. Retrieved 2013-01-25. ↑ "World Proved Reserves of Oil and Natural Gas, Most Recent Estimates". Energy Information Administration. 2009-03-03. Retrieved 2013-01-25. ↑ "Iraqi oil reserves estimated at 143B barrels". CNN. 2010-10-04. 1 2 Calamur, Krishnadev (2018-03-19). "Oil Was Supposed to Rebuild Iraq". The Atlantic. ISSN 1072-7825. Retrieved 2018-03-20. ↑ "Iraq Country Profile". Business Anti-Corruption Portal. ↑ Kramer, Andrew E. (2008-06-19). "Deals With Iraq Are Set to Bring Oil Giants Back". The New York Times. ↑ Kramer, Andrew E. (2008-09-10). "Iraq Cancels Six No-Bid Oil Contracts". The New York Times. ↑ "Oil firms awarded Iraq contracts". English.aljazeera.net. 2009-12-11. Retrieved 2011-06-19. 1 2 ""BP group wins Iraq oil contract", Al Jazeera English, June 30, 2009". English.aljazeera.net. 2009-06-30. Retrieved 2011-06-19. ↑ "Tensions mount between Baghdad and Kurdish region as Kurds seize oil fields". Washington Post. Retrieved 11 July 2014. 1 2 UN Iraq Joint Analysis and Policy Unit (March 2013). 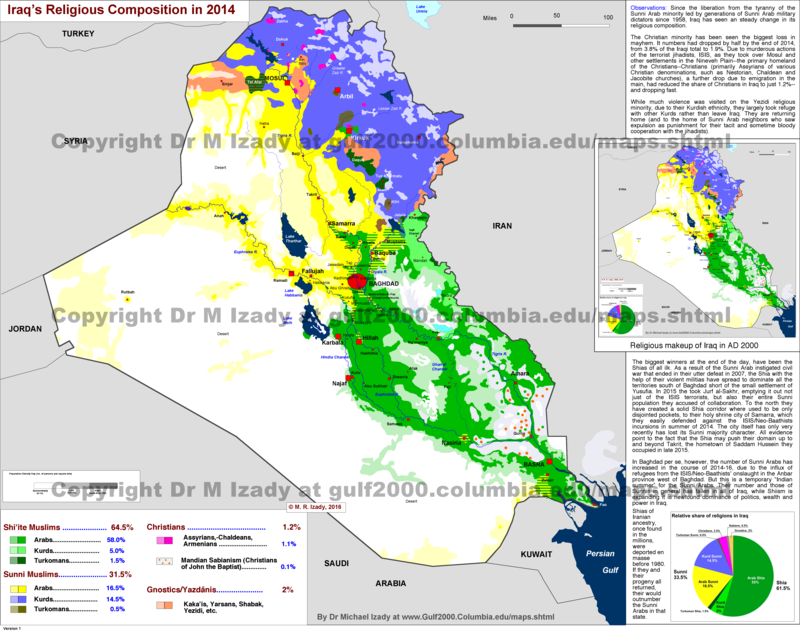 "Water in Iraq Factsheet" (PDF). Retrieved 2018-02-03. ↑ Smith, Matt (2013-09-16). "Iraq faces chronic housing shortage, needs foreign investment -minister". Reuters. 1 2 Charles Philip Issawi (1988). The Fertile Crescent, 1800–1914: A Documentary Economic History. Oxford University Press. p. 17. ISBN 978-0-19-504951-0. Retrieved 2016-08-17. ↑ "Population Census". Central Organization for Statistics. Retrieved 2016-08-17. ↑ "Population Of Iraq For The Years 1977 – 2011 (000)". Central Organization for Statistics. Retrieved 2016-08-17. ↑ "Iraqi population reaches about 35 million". Aswat Al Iraq. 2013-04-27. Archived from the original on January 14, 2015. Retrieved 2013-07-01. 1 2 "Turkey and the Iraqi Kurds: Conflict or Cooperation?" (PDF). International Crisis Group. 2008. p. 16. Retrieved 19 June 2018. ↑ Sharp, Heather (March 3, 2003). "BBC News – Iraq's 'devastated' Marsh Arabs". Retrieved 2008-05-01. ↑ "Chechens in the Middle East: Between Original and Host Cultures". Belfer Center for Science and International Affairs. 2002-09-18. Retrieved 2010-04-21. ↑ McCoy, John (2003). Geo-data: the world geographical encyclopedia. p. 281. ↑ "Iraq's unique place in the Sunni-Shia divide – Pew Research Center". Pew Research Center. 18 June 2014. ↑ "Shias dominate Sunnis in the new Iraq". CBC news World. Retrieved 2014-04-10. ↑ "Iraqi Christians' long history". BBC News. 2010-11-01. Retrieved 2013-01-25. ↑ "IRAQ: Christians live in fear of death squads". IRIN Middle East. IRIN. 19 October 2006. Retrieved 21 October 2013. ↑ Paul Schemm (2009-05-15). "In Iraq, an Exodus of Christians". Associated Press. Archived from the original on 2011-04-29. Retrieved 2010-05-29. ↑ Stone, Andrea (2003-07-27). "Embattled Jewish community down to last survivors". Usatoday.com. Retrieved 2011-06-19. ↑ "Warnings of Iraq refugee crisis". BBC News. 2007-01-22. Retrieved 2007-08-18. ↑ "A displacement crisis". March 30, 2007. Retrieved 2015-11-13. ↑ Lochhead, Carolyn (2007-01-16). "40% of middle class believed to have fled crumbling nation". The San Francisco Chronicle. ↑ Leyne, Jon (2007-01-24). "Doors closing on fleeing Iraqis". BBC News. Retrieved 2010-01-05. ↑ "Plight of Iraqi refugees worsens as Syria, Jordan impose restrictions". ↑ Black, Ian (2007-11-22). "Iraqi refugees start to head home" (PDF). The Guardian. London. Retrieved 2010-05-05. ↑ "Will Iraq's 1.3 million refugees ever be able to go home?". London: The Independent. December 16, 2011. ↑ "Christian areas targeted in Baghdad attacks". BBC. 10 November 2010. Retrieved 10 November 2010. ↑ Sabah, Zaid; Jervis, Rick (March 23, 2007). "Christians, targeted and suffering, flee Iraq". USA Today. ↑ "USCIS – Iraqi Refugee ProcessingFact Sheet". Uscis.gov. Retrieved 2011-12-02. ↑ "Demographic Data of Registered Population". UNHCR. Retrieved 2016-08-17. ↑ "Iraqi refugees flee war-torn Syria and seek safety back home". UNHCR. 18 June 2013. ↑ "Health". SESRIC. Retrieved 2016-08-17. ↑ "Demography". SESRIC. Retrieved 2016-08-17. ↑ "Life expectancy at birth, total (Iraq)". SESRIC. Retrieved 2016-08-17. ↑ "High-Tech Healthcare in Iraq, Minus the Healthcare". CorpWatch. January 8, 2007. Archived from the original on 2007-07-17. ↑ "Literacy rates of 15–24 years old, both sexes, percentage". Millennium Development Goals Indicators. United Nations. Retrieved 30 January 2011. ↑ Touma, Habib Hassan (1996). The Music of the Arabs. Amadeus Press. ISBN 1574670816. 1 2 3 4 5 Kojaman. "Jewish Role in Iraqi Music". Retrieved 2007-09-09. ↑ Manasseh, Sara (February 2004). "An Iraqi samai of Salim Al-Nur" (PDF). Newsletter (3). London: Arts and Humanities Research Board Research Centre for Cross-Cultural Music and Dance Performance. p. 7. Archived from the original (PDF) on December 2, 2005. Retrieved 2007-09-09. ↑ Al-Marashi, Ibrahim (2007). "Toward an Understanding of Media Policy and Media Systems in Iraq". Center for Global Communications Studies, Occasional Paper Series. Retrieved 2016-08-17. 1 2 3 4 5 6 7 8 "Foods of Iraq: Enshrined With A Long History". ThingsAsian. Retrieved 2011-06-19. ↑ "FT - Undersea Cable Aids Iraq's Slow Development". globalcurrencyreset.net. Retrieved 2017-04-05.